Waugh's Bandsaw Service was established in 1966 by the late Andrew Waugh. "Drew" was known as a saw doctor in his homeland Scotland. There he studied the art of saw repair at Stow College in Flakirk township, Stirlingshire, Scotland. He then served a seven year apprenticeship before relocating his family to the US. Drew worked for Simonds Saw & Steel for several years before establishing A. Waugh Bandsaw Service. We are a second generation family business now run by Donald Waugh and assisted by his son Alex. Donald's wife Kim manages the office. Donald began working with his father at the age of 10. Beginning with cleaning and learning about the operation and maintanance of each machine, he learned the art of saw repair. After graduation from high school, Donald went on to continue his education at Haywood Tech located in Clyde, NC earning a degree in wood technology, saw filing, hardwood lumber graining and sawyer. 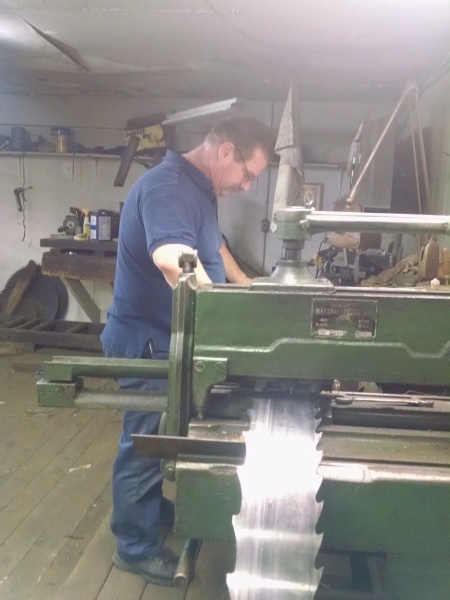 Upon returning to the family business, working side by side with his father for over 25 years as well as some of the best saw engineers in the industry, Donald carries on the family business with honor. Donald continues to operate the business under the same quality and professionalism that the company was started on. Donald remains current with the progressive changes of the saw industry and will continue to provide his customers with the utmost in precision saw repair.